Polywood is a wood-like material that is made from recycled plastics. From afar it does seem like painted wood because this man-made plastic is shaped into boards and planks. But really it contains neither wood nor any wood byproducts. Polywood is produced when high density polyethylene plastics, like detergent bottles and milk jugs are recycled. These are first cleaned to remove the labels and eradicate any residues remaining from the original contents. The plastic is then combined with dye and foaming agents. After it is mixed it is pressed into shapes of plank and board to resemble wood-like appearance. In the furniture industry polywood is used in making chairs, armchairs, outdoor benches, tables, gliders, etc. HDPE or high density polyethylene is a polyethylene thermoplastic made with petroleum. Polywood is weather-resistant, yet chances are that furniture and other objects made from it may fade because of continual exposure to sunlight. Polywood plantation shutters are becoming a popular choice these days. Maybe you too have decided to decorate your windows with this variety and that is why you are here. Perhaps you’re wondering whether to buy plantation shutters made with natural wood or polywood material. If you don’t know what you should buy, then we’re here to help you. It goes without saying that wood plantation shutters are saturated with natural beauty. The rich color variation and the gloss of real wood is just unbeatable. Wood would be the right choice for you if you have a fondness for the look of stained shutters. In terms of strength and weight wood is stronger yet lighter in weight. So with wood plantation shutters you can be sure of greater durability. But they will be more expensive than polywood plantation shutters. Polywood shutters are also durable with long-lasting finish, as the material is tough. You can expect the color to be there for a lifetime. You should definitely consider polywood shutters if wood plantation shutters are out of your budget. A major advantage of polywood shutters is that they aren’t prone to warping when left unprotected to humidity and moisture. These will be the best choice you can make for windows located in areas with high moisture content. But then you’ll have to compromise on weight as these weigh more than wood. More weight may put pressure on frames and hinges that are holding the shutter in place. While wood plantation shutters can be painted to almost any color under the sun, the choices in polywood plantation shutters are usually limited to white and off-white. You should consider wood if you want an exact or a unique paint on your shutters. 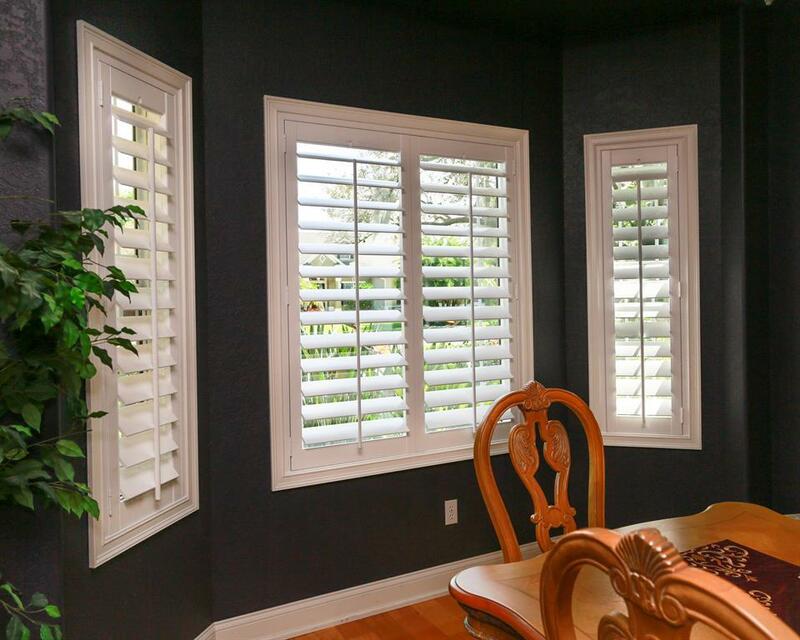 With all this said, which shutter material will be right for you will depend largely on your budget, and then on the location where you want to get shutters installed.